Brazil has been long established in the European intellectual mind as exotic. What I had not appreciated until this visit was the extent to which Brazilians themselves cultivated their own exoticism. Nor, how in their minds, the exotic was equally a part of the metropolis as the Amazon, of modernity as much as the distant past. One example will suffice: there is a widely-held myth that some middle-class residents of São Paolo are now so terrified of their city that they no longer descend to street level, flitting from one high-rise to another by helicopter. They have, effectively, evolved into a race of aerial beings, as unconnected with ordinary Brazilians as the Tupi-Kawahib. As I left Rio to make my way to the Bienal, my friend’s mother—herself a displaced Paolistanos—fixed me with a look of sadness mixed with despair and said, ‘May God be with you’. A latter-day Colonel Fawcett, I was going to a lost world and I was not, evidently, coming back. Arrival in SP naturally dispelled such anthropological fears. As long as you don’t look up, or to the horizon, it is just a big modern city, reassuringly busy with work and money. But it is unbelievably vast—22 million people—and it has a peculiar cityscape all of its own. Its enormity is different from that of Manhattan, where you can always see the edge, or London, whose sprawl is on a human scale and is in any case punctuated by greenery, or even Shanghai, which has the colonial Bund, a sort of Liverpool-on-the-Huangpu. 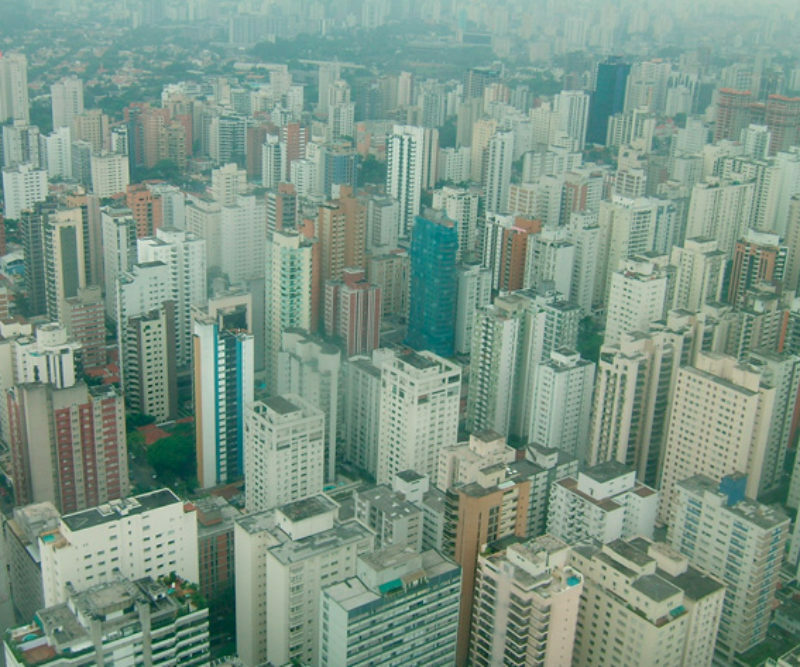 São Paolo, by contrast, seems completely undifferentiated. The entire city, from wherever you stand as far as the horizon, seems to be made of 30-storey point blocks, built in astonishing proximity to one another. The sense of endlessness is greater than in any city I know: it is both terrifying, and in purely aesthetic terms, thrilling. So to the Bienal, which is found in the strangely picturesque Parque Ibirapuera. In many ways, it matches the city in scale. In terms of visitor numbers, a million in total, it far outstrips any other equivalent biennale, and must be one of the most visited exhibitions in the world. It is enormous: 135 artists from 62 countries. You need a couple of days to do it justice. It was also free in 2004, thanks to the sponsorship of a local bank, and its organisers spoke grandly of the democratisation of art as their principal aim. The scale and ambition of the thing is undeniably impressive, memorialised in its permanent home, Oscar Niemeyer’s 1954 Pavilion. The size of the Pompidou, it is both an elegant and exuberant space, the restrained International Style of the exterior containing some spectacular ramps, as if the Illinois Institute of Technology were wrapped around the Guggenheim. What of the show? It was, to begin with, hard not to be distracted by several things: first, the crowds of schoolchildren, often very young, who made up the majority of the audience on the days I went (I approved of this—it certainly dispelled whatever pretensions to cool the Bienal had); second, the views of the city, which even after several days were still compelling; and third, the incredible noise of many of the exhibits. On the ground floor, the chief offender was ‘Bon Voyage’ by Cai Guo- Quiang. This profoundly irritating piece was a 20-foot aeroplane-meets-fish, woven in an open lattice from vines and bristling with thousands of sharp objects recently confiscated from air travellers around the world. In place of the four engines were four electric fans, going full blast, with long streamers attached. This was the source of the racket. What was the point? It made no sense to me: confused in its vision and execution, it offered up every possible reading and none, so generalised an object as to be meaningless. On the same floor you could find a gigantic climbing frame from which was suspended a spinning VW beetle (Leo Shatzl), an upside-down boat made of mahogany (Simon Starling) and a huge bank of speakers blasting out the sounds of gunfire (Santiago Serra). Upstairs, other things clamoured for attention, not least a circumcision filmed in real time by the Bulgarian artist Nassim, projected on two gigantic screens (the ten-year-old girl sitting next to me asked me, being the only adult around, for an explanation: I was an art historian from Edinburgh, I said, and no, I didn’t know what I was doing there either). But by the second day, these circus-like installations came to seem aberrant. What most artists were portraying was a kind of intuitive anthropology, often casting their own familiar surroundings as other, and recording them through endless lists and photographs. It seemed an oddly appropriate thing to be doing in Brazil, a country which since its origins has been the object of harsh anthropological scrutiny. The Bienal was a good place to think about this systematic, sometimes cruel mode of looking: Juan Britos’s photographs of Amazonian Indians clearly fell into this category, as did Edward Burtynsky’s images of the Three Gorges Dam in China, and Thomas Struth’s pictures of the barriadas on the outskirts of Lima. All were beautiful images, but profoundly disturbing because they aestheticised poverty or displacement for the pleasure of the viewer. In Struth’s Lima image, the appearance of Stockbroker Tudor on a slum shack was grimly funny. But it wasn’t clear where Struth stood in relation to his subjects, and what he (and I) were laughing at. It was refreshing by contrast to have the European gaze turned on itself as in Veronika Zapaletalová’s gloomy observations of Czech summerhouses, Krysztof Zielinski’s grim Wabrezno street scenes, and (most clearly) Noyaya Hartakeyama’s snapshots of English suburban houses. Meanwhile the always politically correct Mark Dion sent up the whole business of anthropology, with a faux-naïf reconstruction of Thomas Ende’s 19th-century Austrian expedition to Brazil. Dion assembled a seven-man Austro-Brazilian team to retrace Ende’s steps, each team member adopting a key role—Dion himself was Ende. The results—a range of documents and drawings, parodying Ende’s originals—were displayed as a literally (and metaphorically) wooden museum exhibition. But all this anthropological reflection had a wearying cumulative effect. We are all other was the clear message, but it was unclear to what extent this differed from a bland multiculturalism of the UN. I was tired. I needed a beer. And it was in the bar over a glass of the always reliable Antártica that I saw unquestionably the best, and possibly smallest, work in the entire Bienal: Miguel Calderón’s footballing fantasy. The game between the national sides of Mexico and Brazil was screened on TV monitors over the bar (where else?). It began innocuously enough, but when the underdogs opened the scoring you realised something was amiss. To the accompaniment of a wonderfully convincing commentary, Mexico then opened up a quite preposterous lead. I didn’t stay until the end, but when I left, it was 24-nil. Great stuff.